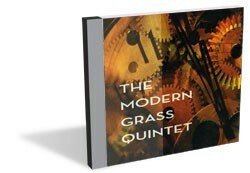 On their self-titled debut album, local all-star ensemble the Modern Grass Quintet live up to their name, taking listeners across a blue-to-new spectrum of modern grassy varietals. The album opens on Joe Cleary’s “Porch Time.” The veteran fiddler leads his mates through a swinging, rootsy reel that indeed evokes time well spent on the front porch. His arching tone is pure and sweet, and he ably trades solos with Steve Light on rambling banjo and sure-handed Andy Greene on guitar. The players straddle a niche between traditional grass and jazzgrass, a hallmark of MGQ throughout the album. Greene takes center stage on the following cut, a pleasant toe-tapper called “City Line.” He has an easy, airy croon that blends effortlessly with Light and mandolinist Stephen Waud’s wispy backing harmonies. Waud’s “Fletcher’s Reel” is next, and lilts along with a breezy Celtic brogue. Cleary is highlighted trading and then matching lines with Waud, whose nimble melody drives the song. “Older Than the Hills” is a rolling, mid-tempo love song that gives way to Cleary’s rambunctious “Dudley’s Breakdown.” The band seems to be most comfortable on instrumental cuts, which is not to say those songs with vocals suffer — they certainly don’t. Rather, there’s a palpable excitement on many instrumental tracks, perhaps owing to adventuresome compositions such as the unpredictable piece Cleary offers here. A nifty cover of “I’m Only Sleeping” is next, with Greene putting his rootsy spin on the Beatles’ classic. It’s not a transcendent version, but there have been far greater crimes against Messrs. Lennon and McCartney over the years. The band digs its heels in on the following number, the Waud-penned “October 1st.” It’s a slinky little tune with winking hints of gypsy mischief. Waud coolly takes over on vocals on the loping “The Open Road.” Light’s “Red Top” is next and plays like, well, a spinning top, solos alternating among bandmates with ease. Greene’s “12 Steppin’ Blues,” a fiery romp about addiction, recovery and 12-step programs, draws the curtain on a sterling effort from five of the area’s finest players. The Modern Grass Quintet celebrate the release of their debut album with a show at Studio Three in South Burlington this Saturday, May 19.